This temple for Sri Maha Prathyangira Devi is situated in a small village called Ayyavadi around 10 kms from Kumbakonam. Located just 500 mts from Uppiliappan temple, this village was once called as Aivar Padi. According to legends, the 5 Pandavas visited this place, kept their weapons under a tree, worshipped Sri Maha Prathyangira Devi and went around in the forests. As the five Pandavas worshipped here, it is beleived that the place was called as Aivar Padi which later changed as Ayyavadi. Shiva arrived as Sarabheshwarar to cool his anger after Hiranyakashipu was killed. While Sarabheshwarar enveloped Narasimha with his wings, Pratyankara Devi came out of one of the wings and fought with Narasimha, eventually succeeding in calming him down. According to another legend, in ancient times, when two sages, Pratiangiras and Angiras were meditating on a moola mantram, a goddess appeared. She privileged the rishis by allowing herself to be named after both of them as Pratyankara Devi. 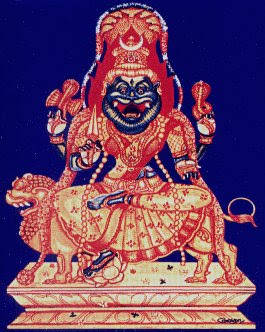 She is depicted in a few temples on pillars as lion faced, and sitting on a lion or on a throne with four lions for legs. The only temple dedicated to Pratyankara Devi is the ancient one at Ayyavadi, which is very near Natchiar Kovil and Uppiliappan Kovil. According to legend, In Ramayana, Indrajit, son of Ravana performed a Yaga called "Nigumbalai Yagam", worshipping Sri Maha Prathyangira Devi. It is beleived that from this Ayyavadi he performed the Yaga. If he had completed the Yaga successfully, he would have got the powers to kill Rama. But somehow it was spoiled by Lakshmana and Anjaneya before completion. Here the Devi is seated on the chariot with 4 lions, 18 arms with weapons possessing Lion's face. This temple is surrounded by Maayanams (Cremation grounds) in all 8 directions. The location is perhaps apt, for the Devi is known to be effective in warding off evil, especially witchcraft. To recognize the lost property. To immobilize the enemies and control their evil doings. For People who doesn't know Rashi & Nakshatra. Visit Sri Maha Prathyangira Devi - Ayyavadi Temple. Sri Maha Prathyangira Devi's worship will take away all evil forces and unsolvable problems from one's life. In this temple Homams are conducted every Full moon day and No moon day, after which huge volumes of Red Chillies are offered to the Goddess. Normally, when red chillies are put in fire, the smoke is enough to make anyone choke on it; however, the specialty of this homam is that there is not even a little bit, even when barrels of red chillies are put in the sacrificial fire! Ayyavadi is located 10 Kms from Kumbakonam and 2 Kms from Thirunageswaram (Ragu Sthalam). It is in Thanjavur District, State of Tamil Nadu, India. All the topics on Prathyangira devi are very informative and useful. it is really verymuch useful.i thank every one. This is Ayyavadi Devasthanam website, details given here. You could also refer. What is the Process to worship devi. Is there any manthra for devi and what is the process. can i get the MERu of Prathyangira devi for doing sadhana at home...? Hi - Please let me know how much does one have to pay as Dakshina for the pooja (Fire Ritual) and Where can one stay in that area and How many days trip does one need to make to plan it best for a Prathyangira Devi Fire Ritual + Important Temples visit in Kumbakonam. Your response will be appreciated . Sir, I want to know the procedure & fees to perform Archana & Homam on every AMAVASYA for 1 year. Please visit the temple once and check with the temple management.